It’s the day after Thanksgiving, and my husband, our four year-old son, and I are coasting through the hills of rural Kentucky. Two days before, we’d driven from Brooklyn to Indiana to visit my family. Now we are en route to the Ark Encounter: a life-size recreation of Noah’s Ark, which happens to be nearby. Two lapsed Catholics, we are going as much out of curiosity as anything else. Though as Donald Trump has been President-Elect for a full two weeks at this point, jokes about the End Times aren’t quite the kneeslappers they once were. Now, when listening to the news, it often feels as though the four horsemen are charging toward us, personally, at Kentucky Derby-like speeds. So what could it hurt to do a bit of shopping around for end-of-world survival techniques? It certainly beats the standard Black Friday fare of bashing through the doors of a Walmart. As we glide through the beige countryside, I marvel at the view: the vast expanses of wide, open field. The misty-hills dotted with picturesque barns. An enormous Confederate flag snapping in the breeze beside a roadside home. Upon spotting the stars and bars, my husband ever so gently increases pressure on the gas pedal. As someone who grew up in 1980s Northern Ireland, he is well versed in accelerating through areas that don’t appear particularly welcoming. I spot a Hillary billboard in the distance, and feel a twinge of surprise. But as we draw closer, I see that she has a long, pointed Pinocchio nose. “Trust Her?” It asks, in cryptic, Freddy Krueger-style font. Eight years ago, on one of our travels through the Midwest, my husband and I visited the Creation Museum, a center devoted to the idea that Earth is a mere 10,000 years old. So the Ark crowd feels familiar: lots of Amish bonnets and families of at least five, including children who look like they could star in milk commercials, such are their wholesome features and gleaming teeth. I vividly remember the Creation Museum’s Ark exhibit. There, Noah was explained via a theatrical film experience that included an animatronic teenager and a bunch of misting flood simulators that ruined my blowout. So I have a vague idea of what we might encounter on our Ark Encounter. This time I have worn a jacket with a hood for blowout protection purposes. Ken Ham, the guy behind the Creation Museum, is the same mastermind who made the Ark Encounter a reality. Ham is the founder of Answers in Genesis (AiG), a fundamentalist organization that advocates for a literal interpretation of the Bible, and they eschew much of science, specifically: geology, cosmology, evolutionary biology, and archaeology. (They basically aren’t fond of any of the -ologies.) Naturally, the museum and Ark have, shall we say, raised the hackles of science-minded folks. As has the Ark’s $18 million in state tax incentives, which some feel dances a wee bit close to the line separating Church and State. But it was Ham’s dream to rebuild the Ark using the exact dimensions as laid out in Genesis: 85 feet wide, 51 feet high, and 510 feet long. And he did it. Though creating the largest timber-framed structure in the world wasn’t cheap: it ultimately cost around $100 million. Nor is it cheap to enter the Ark. Tickets for adults are $40, and $28 for kids. Not to mention $10 for parking. I can only imagine the wallet-decimating cost for these huge families. All photos by Johanna Gohmann. As we ride the shuttle bus down a winding road, I flip through my brochure and see what $100 million buys you. Along with the Ark, there’s also a small zoo, dining at Emzara’s Kitchen, and the Screaming Eagle Zipline and Aerial Adventure. I don’t recall there being a zipline element to Noah’s story, but it has been a while since I’ve revisited the tale. I do remember the gist of the thing though: God gave us a perfect world. Man fell from grace, so God decided to wipe everyone out, except the only decent dude around (Noah). God told him to build the ark, and to bring his family, and a set of each kind of living creature. Commence non-stop rain for 40 days and 40 nights. “There’s the ship!” My son shouts. We disembark from the bus, and there it is indeed—floating not upon the roiling sea, but a stretch of muddy farmland. As we approach the gargantuan structure, it’s hard not to feel a pinch of excitement, and for that, I must tip my hat to the Ark engineers. The last time my pulse was quickened by the mere sight of a sea vessel was probably a viewing of Jaws. When we enter, I’m surprised at how shadowy and dark it is inside. Though I don’t know what I was expecting; it wasn’t like Noah had access to fluorescents. We shuffle through, and see the first deck is filled with stacks upon stacks of wooden animal crates. You can’t see the animals inside, but you can hear them. Various squawks and growls and monkey calls emanate from hidden speakers. What I find most notable about the cages is their uniformly small size. As if Noah decided at the last minute to bring only thousands of gerbils. I can see looks of wonder on the people milling about me, and while I am also impressed by the sheer enormity of the structure, I must admit, I’m not that dazzled by the space, which looks like a giant, modernized barn. It would not shock me if Mumford and Sons strung up some bistro lights and recorded their next video here. I spy three women gazing around with beaming smiles. Being black, they stand out a bit in the predominantly white crowd. They are Ashley 29, Darshea 30, and Paulette, who is “in her 60s.” They are co-workers and friends, and drove 14 hours from New Orleans to see the ark. They seem almost giddy with excitement. “We’re all religious,” says Paulette. “And to see the replica of Noah’s ark…it’s a once in a lifetime thing.” She smiles at me. For Darshea, seeing the ark has her choked up. She can’t get over how much work has gone into its authenticity. I ask if they think we’ll ever need another ark, or another vessel to save us from end times? “We pray not,” says Paulette. “But we as Christians know that we have a better place to go to. “Last time I checked the Bible, he said next time I’m not coming with water, I’m coming with fire.” Ashley says. “Well, I mean. Donald Trump’s hair is red.” Darshea quips, and we all laugh loudly together, seemingly in agreement that the end of the world is indeed hilarious. Darshea and her buddies aren’t the only ones who have traveled great distances to see the Ark. True, many people were already traveling for Thanksgiving, but the Ark still seems to be a major aspect of their trip. I speak to a mom from Tulsa, a teenaged boy from Texas who’s come with his grandparents, and a 24-year-old woman from Minnesota: all of whom are seriously psyched to be there. I realize that much more than the ark, I am in awe of the bold, intense faith of its visitors, and the happiness this place seems to bring them. A woman in front of me is scrolling through Amazon on her phone. “Yeah, most of the really good deals are already gone,” she sighs. She is clearly trying to sneak in some Black Friday shopping before viewing the fall of man. I, too, am delighted to learn the Ark has wifi. 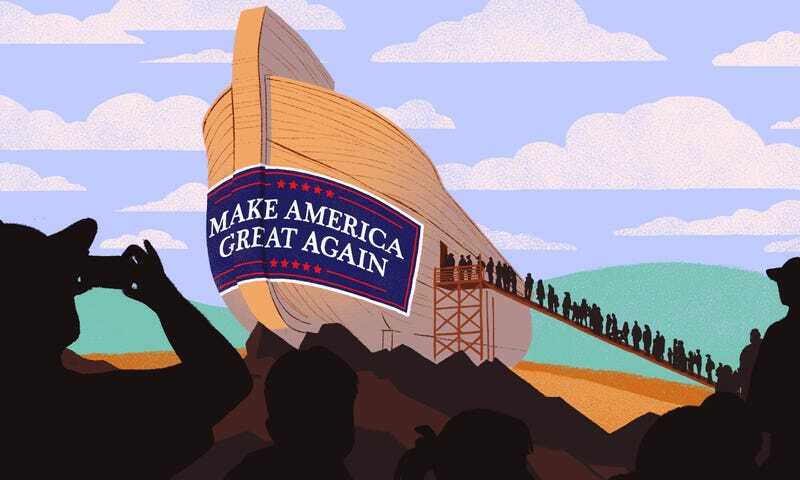 I pop open Facebook and ponder what sort of status Noah might have posted: I’m so glad I wasn’t chosen by God to board that huge boat and be one of the last humans in existence – Said no one ever. ☺ Or: That moment when you realize you brought only one unicorn. ☹ Or maybe just a simple: OMG rain! WTF? After ten minutes, I accept that there’s no way my four year-old is going to wait in a line this long unless it ends in a ball pit. But merely for a glimpse of the pits of hell? Forget it. I google some pics of the exhibit to see what I’m missing. Looks like lots of illustrations explaining how God gave us the perfect world and then we trashed it like teenagers on spring break. There’s even a full-scale diorama depicting sinners partying it up, including a gyrating woman with a mane of brown hair, who I can’t help but think bears a striking resemblance to Bristol Palin during her Dancing with the Stars stint. Unless it ends in a ball pit, my four-year-old is not going to wait in a long line. I tuck my phone away and scan above and below deck, trying to spot my husband and son. The movement gives me mild ark vertigo, and I almost walk backwards into a crate containing a small replica of a dinosaur. I narrowly miss it due to the swift movements of an Amish woman who nudges my arm. I finally spy my husband and son at the bottom of the ramp. They’re beside a small snack stand, where one can pause from contemplating man’s descent into darkness and refuel with a bag of Doritos. I purchase some cookies for my son and a $3 Pepsi for myself. Cookies eaten, I can see my son is growing restless. I spy a section called the Fairytale Ark with wide-eyed cartoon animals perched atop in greeting. We head toward it, and I’m hopeful for a Lego table. We enter, and are instantly greeted by a large placard that reads: “And everyone died except the 8 people in the ark.” Well. The Disney Store this is not. The centerpiece of the room is even more startling, as it’s a large bookcase filled with colorful, brightly lit Noah’s Ark toys and books behind glass. There’s also some creepy, piped in music box music playing overhead which my husband later claimed I imagined. I let my kid stare longingly at the miniature plastic sheep and cows for a few minutes, before ushering him over to The Door exhibit. The massive set of wooden doors is meant to represent Jesus being our one door to Salvation. There’s a small crowd gathered around it, as people take turns posing playfully for photos. It’s like they are doing the standard tourist shtick of pretending to prop up the leaning tower of Pisa. Except here they give exaggerate grimaces, like they are really throwing their back into prying open the door to salvation. His one complaint: the Ark is too crowded. I nod, thinking how if that’s the case, Daniel might not have fared well on its maiden voyage. I thank him for the chat and wish him well on the rest of his travels. After the Ark, he’s headed to Santa Claus, Indiana. Up on the third, final deck, we get to see what the Ark’s living quarters were like. They are far more stylish than I’d expected. There’s a hint of Anthropologie about the place—lots of draped fabrics and tasseled throw pillows. Animatronic men and women lounge about reading or performing basic household chores. My son is fascinated by the animatronic woman chopping vegetables. “Does she have a toaster oven?” He inquires. Unlikely, my boy. We amble through exhibits about how the Great Flood changed the topography of the earth, and see a small bit on how we are all descendants of Noah. By the time we make it to the gift shop, I’m exhausted. The gift shop is filled with standard gift shop fare: t-shirts and ball caps and stuffed animals arranged on the shelf two by two. I spy a 50-ish woman sifting through scented candles. She’s wearing a bright pink sweatshirt with a big Tinkberbell on the front. “Tink” it reads. She picks up an Ark-inspired candle and gives it a sniff. “Are we done yet? I’m hungry.” My husband implores me while our son bats him in the face with a stuffed serpent. I tell him we are, and we head for the exit. On the way out, I notice a bright-eyed teenager manning one of the cash registers. She looks like she’d be at home handing out Oreo blizzards at the Dairy Queen. Instead, she’s selling neon t-shirts that say “Faith Like Noah”. I hold up my phone and ask if I can ask her some questions. A woman who looks like her manager is suddenly heading toward me, wagging her finger at my phone. “Uh, you’re not supposed to do that.” She says. I shrug and shut off my phone, making my way to the door. Though I want to ask her what exactly I’m not supposed to do? Ask questions? Outside, we head to the line of shuttle buses and pass a snack booth called Creative Kernels. “Want some pork rinds or kettle corn?” I call up to my husband, but he is already boarding a shuttle. Back in the parking lot, my husband heads off to locate our car, and I stand with my son. We can see the Ark looming in the distance, the zipline structure at its side like a stairway to nowhere. Will someone or something come to save us all in the end? Or can we save ourselves? I’d like to think we can. I’d like to think that the kind of country that has people who come together to celebrate their faith while also riding a zipline and eating pork rinds – Surely this is part of what makes this country great. Just as the protesters who once lined the highway here—the angry atheists and people who opposed all of that state tax money—make it great. I’d like to believe we are a nation not just of inflamed passions and prejudices, but one that has, at its very heart, kindness and understanding. The sort of place where when you accidentally back into a caged dinosaur display, a stranger in an Amish bonnet eating a bag of Mrs. Vicks pauses from her snacking, and reaches a BBQ-flavored hand to steady you. Some elderly people shuffle by me on walkers, and I see them heading to a car with a Trump bumper sticker. I think how Noah and his family clung to the idea of something to save us all, even if the very thing they were clinging to defied all logic and reason, and held impossible promises of salvation. True, it worked out for them in the end, but it came at the price of millions of innocents. Which all sounds vaguely, creepily familiar. One thing is for certain: if we’re going to somehow save everyone who believes they are the right ones, they are the good ones, and they are the ones who truly have the answers. Well. We’re gonna need a bigger boat. Johanna Gohmann is a writer living in Brooklyn.